11 March 2019, Ingrid Tieken-Boon van Ostade, “Her Ladyship en The Queen’s English”, HOVO course Bye bye Britain, University of Leiden. 18 December 2018, PhD defence by Viktorija Kostadinova, Leiden University Centre for Linguistics. 22 November 2018, Morana Lukač defended her PhD thesis at Leiden, called Grassroots Prescriptivism. 22 September 2018, Ingrid Tieken-Boon van Ostade gave a talk called “Of greengrocers, footballers, sports commetnators, estate agents and television presenters: Who’s in a usage guide and why” at the workshop In the Shadow of the Standard at the University of Liverpool, organised by Olivia Walsh. 27-31 August 2018, ICEHL-20, University of Edinburgh: Ingrid Tieken-Boon van Ostade – Published in America – but is it an American usage guide? 28 September 2017, Morana Lukač gave a talk entitled “Language guardians: the role of mass media in linguistic prescriptivism” at LUCL Sociolinguistic Series. 25 July 2017, Morana Lukač gave a talk entitled A corpus-based approach to investigating twenty-first-century prescriptivism at the Corpus Linguistics Conference 2017 held at the University of Birmingham. 9 December 2016: Bridging the Unbridgeable Usage Guide Symposium, Leiden University Centre for Linguistics. 24 August 2016, Ingrid Tieken-Boon van Ostade gave a plenary lecture called “English usage guides and the Age of Prescriptivism”at ICEHL-19 (University of Duisburg/Essen). 17 June 2016, Carmen Ebner gave a talk entitled “’Well, here comes the value judgement…’ – A sociolinguistic investigation of usage attitudes in British English” at the Sociolinguistics Symposium 21 held at the Universidad de Murcia. 15 June 2016, Viktorija Kostadinova gave a talk entitled “Language variation and change, speakers’ attitudes and prescriptivism: the case of ‘literally'” at the Sociolinguistics Symposium 21 held at the Universidad de Murcia. 25 May 2016, Inge Otto (our former project member) gave a paper called “Level of Education and Dutch Speakers’ Perception of Spoken Norm Violations” in our lunch lecture series. 22 April 2016, Harry Ritchie gave a talk entitled Ashamed of your English? in our lunch lecture series. 1 October 2015: Folgert Karsdorp (Meertens Instituut) gave a lecture entitled Python for the Humanities as part of our Lunch Lecture series. 2-5 September 2015: Hands on HUGE. Workshop at the SLE conference at Leiden. 16 June 2015: Ingrid Tieken-Boon van Ostade gave a talk at the Huygens Instituut voor Nederlandse Geschiedenis in The Hague, called digitaal publiceren? 6 February 2015: Carmen Ebner, Viktorija Kostadinova, Morana Lukač, Robin Straaijer and Ingrid Tieken-Boon van Ostade will present a workshop “called “How Useful are Usage Guides?“, organised by TeamWork. 21 October 2014: 7th Bridging the Unbridgeable Lunch Lecture. Amanda Delgado Galvan will show ELAN, a professional tool for linguistic annotation of audio and video material. 26 and 27 June 2014: Cambridge English Usage (Guides) Symposium at the University of Cambridge. Abstracts here. 18 November 2013: end of our second exhibition on Bryan A. Garner, author of Garner’s Modern American Usage. 22 October 2013: Ingrid Tieken-Boon van Ostade, ASH Colloquium talk, “Study Attitudes to English Usage”, Clare Hall Cambridge. 6 September 2013: Carmen Ebner and Morana Lukač, “E-BBC: Investigating auntie’s online language usage”, 1st PARLAY conference at the University of York. 30 August 2013: Ingrid Tieken-Boon van Ostade, “An early American English usage guide”, LModE-5 at the University of Bergamo. 11 June 2013: Workshop Attitudes to Prescriptivism, organised by Robin Straaijer, Carmen Ebner, Viktorija Kostadinova and Morana Lukač. 11 June 2013: Carmen Ebner, “Watchdog BBC,” and Morana Lukač, “Linguistic Prescriptivism in Letters to the Editor”, workshop Attitudes to Pescripivism. 12-14 June 2013: Conference Prescription and Tradition in Language, organised by the Leiden University Centre for Linguistics (LUCL) and the Leiden Institute for Area Studies (LIAS). 13 June 2013: Ingrid Tieken jointly with Wendy Ayres-Bennett, “The Battle of Prescriptivism: France vs. England”, Prescription and Tradition in Language. 14 June 2013: Viktorija Kostadinova, “The Cyberstate of Language”, Robin Straaijer, “A Perspective on Prescriptivism, Prescription and Tradition in Language. 15 June 2013: Ingrid Tieken-Boon van Ostade, “Wie is de baas van het Engels?”, public symposium, University of Leiden Centre for Linguistics “Wie is de baas van de taal?” (Who makes the rules in a language?). 10 April 2013: Guest lecture by Anya Luscombe, called Auntie and Prescriptivism: the fine line the BBC treads to ‘uphold language standards’. 5 April 2013: Viktorija Kostadinova, “Researching Language Attitudes in a Digital Age”, the 8th Newcastle upon Tyne Postgraduate Conference in Linguistics. Fitting with the topic of her paper, it was given via Skype. 27 March 2013: 6th Bridging the Unbridgeable Lunch Lecture Researching Language Attitudes in a Digital Age. Viktorija Kostadinova talked about using the internet in sociolinguistic research on language attitudes. Her blog is called Languitudes. 26 March 2013: Carmen Ebner presented her PhD project Proper English Usage at the PG Linguistics Workshop in St Andrews. 9 February 2013: Robin Straaijer demonstrated the database of usage guides and usage problems during the Taalkunde in Nederland-dag at Utrecht University. 6 February 2013: Morana Lukač spoke about her research within the Bridging the Unbridgeable project at the LIP Group (Lancaster University). 6 December 2012: 5th Bridging the Unbridgeable Lunch Lecture. Morana, Carmen & Viktorija gave a Prezi workshop. 22-25 November 2012: Viktorija Kostadinova gave a presentation at the Berlin Student Conference, presenting her findings on a Facebook attitudes survey which she is currently carrying out. 2 November 2012: Ingrid Tieken-Boon van Ostade, “Attitudes to English Usage: Towards a New Research Model” (LUCL, Lipsius 147), 3.30 – 5 pm. 29 October 2012: 4th Lunch Lecture. Presentations by Carmen Ebner Perspectives on Language: Correctness vs. Usage and Matthijs Smits ‘Garnering’ Respect?’ The Emergence of Authority in the American Grammatical Tradition. (van Wijkplaats 4, room 004), 12am – 1 pm. 19 September 2012 – 18 November 2013: New Bridging the Unbridgeable Exhibition on Garner’s Modern American Usage. English Department, University of Leiden, 2nd floor. 21 September 2012: 3rd Bridging the Unbridgeable Lunch Lecture. Launch: A database of English usage guides and usage problems. Friday. 12 October 2012: Project presentations by Carmen Ebner, Viktorija Kostadinova and Morana Lukač (LUCL, Vrieshof 4/008a), 3 – 5 pm. 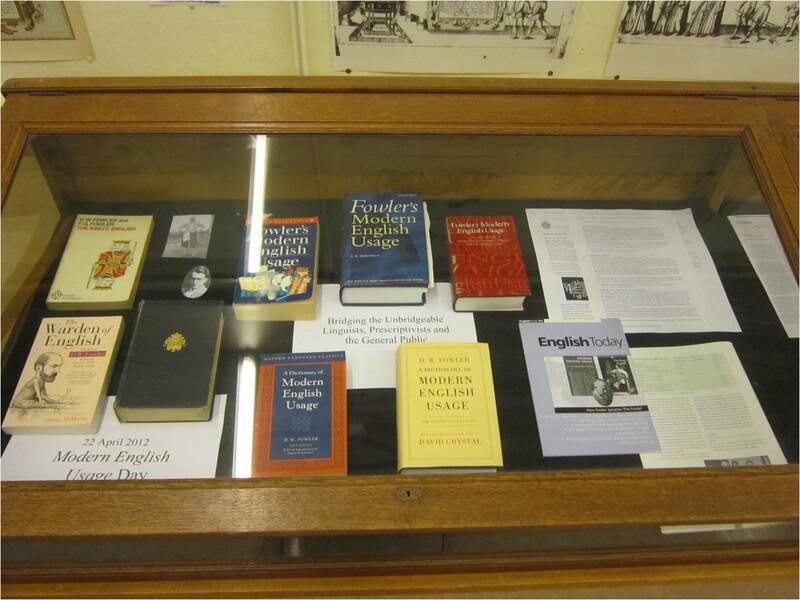 22 April – 19 September 2012: exhibition Modern English Usage Day, English Department, University of Leiden, 2nd floor. 4 February 2012: TiN-dag, Drift 25, Utrecht (The Netherlands). Paper by Ingrid Tieken: “What’s wrong with Prescriptivism, John Honey, the Split Infinitive?”.